The chanson de geste is an essential experience in any French Literature program, and yet many of us have allowed the Chanson de Roland to define the genre through excerpts from commercial literary anthologies. Thus we fail to note the chanson de geste's cycles, its thematic variety, and its evolution in the 13th and 14th centuries towards the fantastic. This page presents links to 73 manuscripts containing chansons de geste, indexed as in provided online contents. But we also have links to online editions of over 80 different chansons de geste, and other relevant resources. 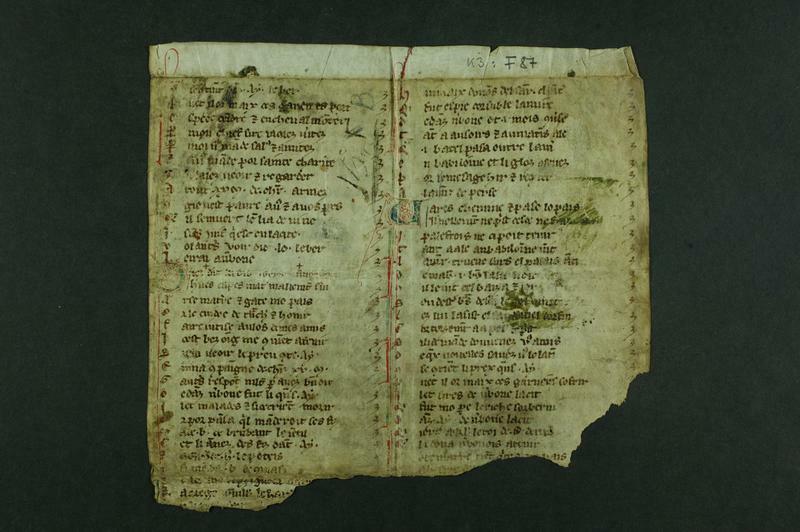 It is part of the Andy Holt Virtual Library's "Manuscripts of Medieval France with Vernacular Texts", a collection of over 800 links to manuscript facsimiles and nearly all of the French medieval literarary canon. MS Paris BNF fr. 778 (Anc. 7188) - Berthe au grand pied, Roman de Charlemagne, etc. MS Paris BNF fr. 786 (Anc. 7190) - Roman de Godefroy de Bouillon, Chanson de Jérusalem, etc. MS Paris BNF fr. 1448 (Anc. 7535) - Aimeri de Narbonne, Enfances Guillaume, etc. MS Paris BNF fr. 1598 (Anc. 7618) - Chanson d'Agolant ou d'Aspremont, etc. MS Paris BNF fr. 1637 - Cipéris de Vignevaulz, chanson de geste, Doon de Mayence, etc. 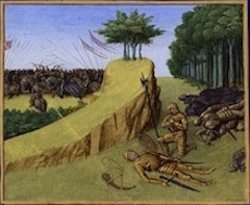 Bataille de Loquifer et de Renoart. 38 leaves, fragments of "La chanson d'Otinel, La chanson d'Aspremont, Le couronnement de Louis," etc. Enfances Oger le Danois, etc. Roman de Berte aux grands pieds par ADENET LE ROI, etc. MS Paris BNF fr. 17203 - JACQUES DE VITRY, PSEUDO-TURPIN, Chroniques françaises, etc. Aiol, chanson de geste …, v. 1-10983, etc.